Want the best terrarium plants for your homestead? If you’re looking to brighten up your home with a little greenery, then these 17 terrarium plants will give you a foundation of ideas to work from. Creating a mini garden inside a sealable glass can be both easy and tricky. But if you have a green thumb like me, then learning this kind of gardening is not only trouble-free but also rewarding. Why? It’s because aside from it adds a touch of outdoor beauty and peace to your indoor decor, terrarium has that therapeutic effect. As the flowers begin to wane outside because of weather changes, it’s a great time to focus on bringing natural beauty into your home. I’ve gathered some beautiful and unique ideas for creating your own terrarium plants. You can even find plenty of time to relax since they are very easy to maintain. No matter what plants you use, I love the variety of unique and creative containers used to house this beautiful terrarium plants. Let’s get started with these beautiful tutorials for terrarium plants in your homestead. Transform your simple mason jar into a beautiful terrarium that is sure to become a focal point in your homestead decoration. You can leave it open or closed – it’s totally up to you. Find the tutorial here. Eager to try the terrarium trend but don’t know where to begin? Well, better get started with succulent plants, as they’re easy to grow, requires a very little maintenance and provide your homestead beautiful aesthetics. Get the tutorial here. Bring this to your homestead and relive the fun and horror of the 1988 classic comedy horror film Beetlejuice. The Beetlejuice terrarium captures the spooky feeling of the rundown house on a secluded hill, a scene where the majority of the action happens in the film, making it an awesome memento of the cult movie. Click here to read more. This coffee pot terrarium will remind you to take a break and have a cup of your favorite coffee. It’s sure to be a wonderful companion to a lazy afternoon. Find the full tutorial here. Want put some greenery inside your home, but not keen on tending a high-maintenance plant? Worry not, because this mini moss terrarium is a hassle-free bit of greenery that requires little maintenance. Get the full tutorial here. 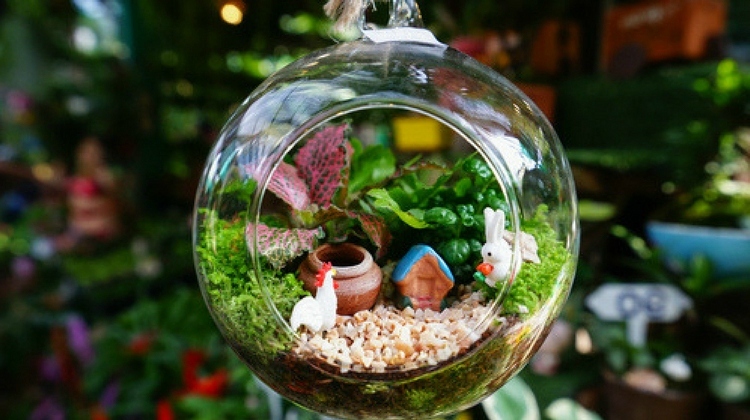 With carnivorous terrarium, you get the best of both worlds, greenery and pest control. Super cool, huh! I definitely want this for my homestead. Click here to learn how to care for a carnivorous terrarium. There are so many forms and uses in which you can recycle a light bulb and using it for a terrarium is like giving it another way to have its light shine on. Click here to learn how to make a light bulb terrarium. If you love the inviting bag end house, this Hobbit home terrarium is a perfect addition to your homestead. Find the tutorial here. Super cute and lovely isn’t it? Make one, two, three, I guess you can’t stop yourself once you started making these wood base terrariums. I’m sure they will have plenty of space to thrive in your homestead, or you can give them away as souvenirs to your guests. Find the tutorial here. Let your terrarium shine by adding LED lights inside. Make sure to turn them on at night to transform your mini garden into a whimsical glowing jungle. Get the tutorial here. If you love the beach and never want to be too far away from it, create your own beach-inspired terrarium to bring the beach indoors. Find the tutorial here. I was mesmerized at this beautiful layered cactus terrarium. I actually got hungry because it looked like a black and white cake, wow! Well, this will surely add some flavor and color to your homestead. Find the full tutorial here. This terrarium plant is on my list to share with my grandkids. If you’re like me that has grandkids that can’t get enough of story time, bring their fantasies to life and give them this enchanted project to create. I’m pretty sure you’ll never regret the result. Get the tutorial here. You know what I think? You’re gonna dig into this DIY on your next DIY weekend. I’m gonna give a simple suggestion: to have fresher, bolder effect, add some colorful rocks at the base of your terrarium to really make a statement. Find the tutorial here. This woodland terrarium will give your homestead an upgrade that will showcase your love for nature. Find the tutorial here. Water terrariums are a fabulous idea for tabletop display. Have this lovely centerpiece that can take you all the way through winter and beyond. Find the tutorial here. Spruce up your ordinary glass ornaments by turning them into beautiful terrariums that you can use to replace your generic Christmas tree ornament, plus it will even after the Christmas season is over. Find the tutorial here. There you have it 17 terrarium plants you’ll love for your homestead. Making one can be messy but let’s admit that it’s also fun, and they’re all easy to make! A wonderful and creative way to ensure that you always enjoy the outdoor beauty and peace. Which terrarium plant will have a place in your homestead? Let me know in the comments below. Ready for more gardening ideas? Get more here.